It allows plotting data with more than 650 columns, doubling up to about 1300 columns. Previously, there was a limit due to how the data table handles columns by default. A user wanted that plotted data do not include the low/high margin (blank area) for the X or Y axis, but rather have the plotted data (and therefore X and Y axis) scale right up to the graph boundaries. 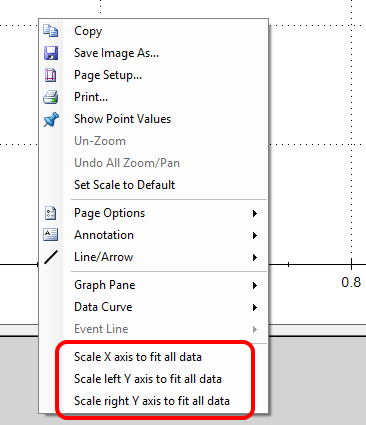 Now, if you right-click on a graph with data, the bottom menu three actions allow you to quickly set this look for X, Y or Y2 axis. Furthermore, there are new Options to enable this cropped behavior during a Data Swap so that this does not have to be done manually for each graph. See Options for those settings. This update fixes a bug in data swap, which prevented swapping data if the new data file contained empty cells/input. 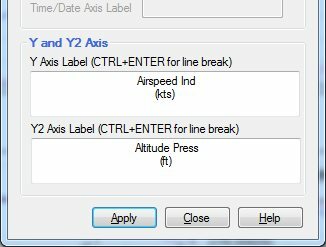 You can override the existing Y and Y2 axis labels. You can also use CTRL+ENTER keyboard command to force a line break. The second update brings additional time/date formats for those who want more control over how this is displayed. The following screen shot shows all formats, but basicall, Month Year (May 2014), Day Month (14 May), and a slew of DD/MM/YYYY and MM/DD/YYYY formats were added. After some time away from the code, I’m starting to get back into it and updating DatPlot. This minor update brings more input file format flexibility. Previously, you could not have any blank or non-data lines (other than delimited header and unit lines) before the delimited numeric data is presented. Now you can. Nothing changes in terms of using DatPlot. You must still specify the line number where your plot data starts, and, optionally, the parameter name and unit line numbers. But you can now have comment lines and blank lines prior to those key lines. You still cannot, however, have non-data lines after your plot data block. Hopefully, this makes DatPlot more useful. Previously, DatPlot could only use CSV files where the number decimal symbol used matched the symbol of the host computer’s OS regional setting. In some countries, such as the United States or Australia a dot (.) is used as the decimal mark. In other countries, including most European countries, a comma (,) is used as the decimal mark. If a CSV file was created in France using a comma decimal mark and another user in the United States (where the dot is the common decimal mark) tried to open that file, DatPlot would not know what to do with it. The user would have to find/replace all commas with dots before importing the CSV int DatPlot. When DatPlot is started, the decimal symbol displayed is defaulted to the symbol set in Windows’ Regional Settings. 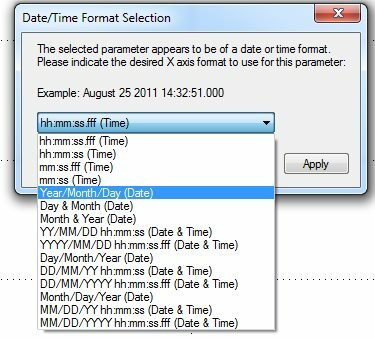 If you typically deal with CSV files that use the same symbol as used in your country, then no change to this parameter is required. The decimal symbol you select during CSV import is used for all future DatPlot work until you either 1) quit/exit DatPlot or 2) import a new CSV and change the symbol during import (note that changing the symbol only affects the running DatPlot program, not your operating system or any other programs running). If you open a pre-1.3.8 saved DPM plot file, the decimal symbol used in it may differ from the symbol DatPlot is currently using. If you decide not to update the DPM file with the decimal mark used, simply click Cancel. In that case, you will see this prompt every time you open the DPM file. Note that pre-1.3.8 versions of DatPlot can still open DPM files with version 1.3.8 and on.